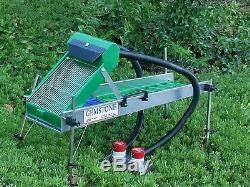 Gemstone All - U - Need 10 Sluice Box. 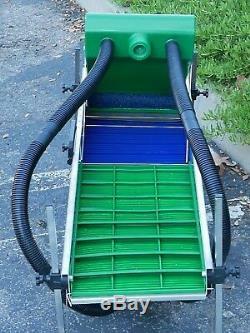 The All-U-Need Sluice/Highbanker is supported by built on stand that is constructed with High strength Glass filled Nylon box swivels and Leg fitting. Legs are SS that stand up for years without rusting, most competition is plated steel that will wear off in time and rust. Legs are supported by Stiff light weight rods which all for Folding the unit into light weight package easy to transport. Threaded knobs come at all locking positions. (most other High priced units are much heavier). Five section recovery allow you to leave the Riffles in place for days without the need to check often, Gold will be 95% or higher in Second stage recovery Box, rest may or may not proceed down the chain of collection. (rubber Riffles are retained with SS rods that hold the Riffle tight). Compact Header box - comes with easy adjustable angle legs that fold up when transported. 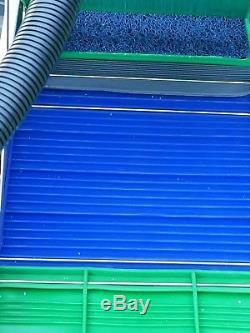 Header box has water Spray cover that covers material deposited on Separator screen instantly forcing Gold and material down into high energy flow area that forces Gold by weight into back of Gold catch box. High velocity direction change flushes lighter material out of catch box and leaves the heavy black sand and Gold. (box can be taken out in 10 seconds to check recover). Stage 1 SS Grizzly Screen. Stage 2 Recovery Impact Box (with Miners Moss) 95% of Gold will stop in this box. Stage 3 V-Section Mat V-riffle is for first look to see if Gold area is producing gold worth the work or if it's time to move to a more productive area. Having V-riffle allows for that first look without taking riffles out. Stage 4 Famous Blue Riffle (known as the best recover on high bankers). Stage 5 Famous Green Riffle (Low to high flower Gold recovery section). Five levels of recovery insure highest Recovery at any flow rate of water in the sluice of all competition not matter what price range even the most expensive cannot beat this machine. 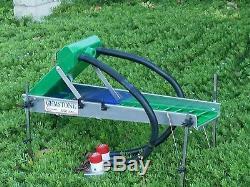 Sluice box weight alone 9.5 Pounds - 2 pumps 1100 GPH or 2200 total GPH. 1 meter each - unit 12v dc 6.0 amps combined. (less than most single pumps with combines flow) Duel Pumps come with stand that holds both pumps in place at water source. The item "Gemstone All You Need 10 5 Stage Power Sluice Box/Highbanker" is in sale since Monday, December 31, 2018. This item is in the category "Collectibles\Science & Medicine (1930-Now)\Mining\Equipment". 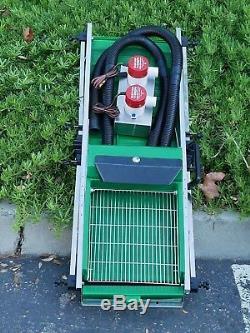 The seller is "willybbaer" and is located in Simi Valley, California. This item can be shipped worldwide.